Park near Shelter 10 in Sertoma Park, 300 Riverside Park Road, and get on the trail, heading south. Just past the sand volleyball courts, you will see a sign that takes you off the trail to a non-paved nature trail that takes you through a 1.5 mile loop. The first .8 mile is gravel and the next .7 mile is paved including a trip through the underpass below the Bismarck Expressway. This 3/4 mile trail is as enjoyable as it is educational. 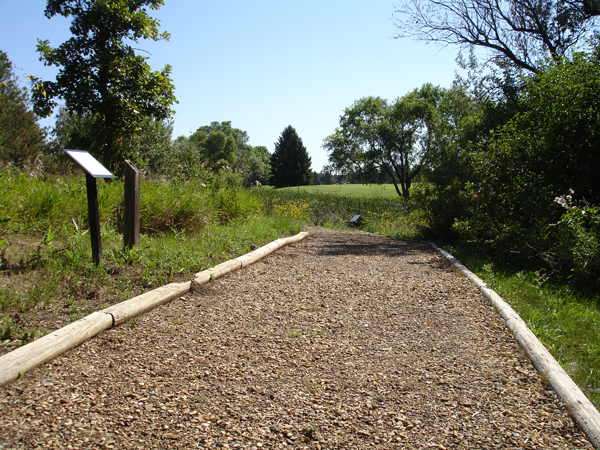 Located on the Pioneer Park Overlook off Burnt Boat Road, this trail covers the layout and features of the Earthlodge Village occupied by the Mandan Indian Tribe dating back to 1675.
Who was General Sibley, and why is this park and campground named after him? What’s the history of this beautiful park, and what makes this ecosystem unique and important? 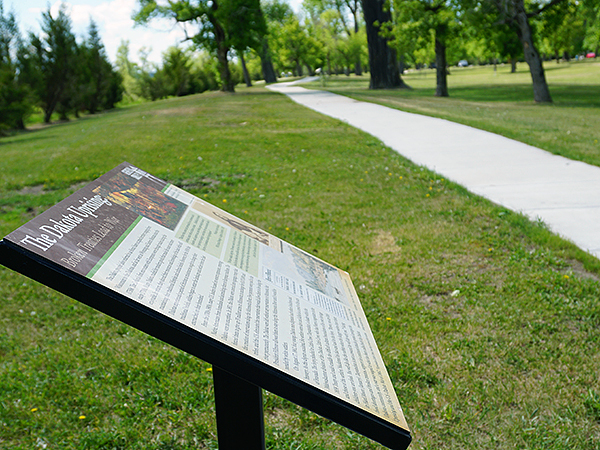 Find out the answers to these questions and more when you stroll along the 0.6 mile interpretive trail and involve yourself with the historical and environmental panels that tell a unique story. 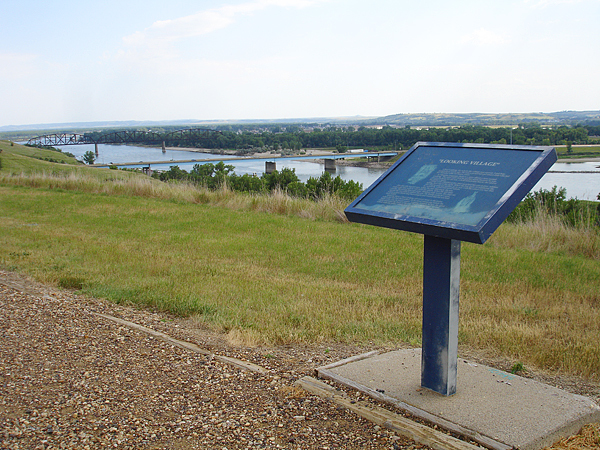 The trail winds along the western edge of the park, with views of the mighty Missouri River. Bismarck and Mandan share the honor of being named one of 52 national Millennium Legacy Trail designations for the Missouri Valley Millennium Trail. This trail connects all things historical, recreational and cultural along the Missouri River. The trail starts at Chief Lookings’ Village in Bismarck, continues along the riverfront trail, past the Dakota Zoo, crossing over the Missouri River at either Memorial Bridge or the Expressway Bridge to Mandan, where the trail travels through some amazing historical scenery all the way to Fort Lincoln State Park. The Millennium Trails initiative promotes trails as a means of preserving open spaces, interpreting history and culture, enhancing recreation and tourism, improving physical fitness, and connecting our daily lives with the natural environment. Under this initiative, trails across America were recognized, enhanced, or built as part of our nation’s legacy for the new millennium. 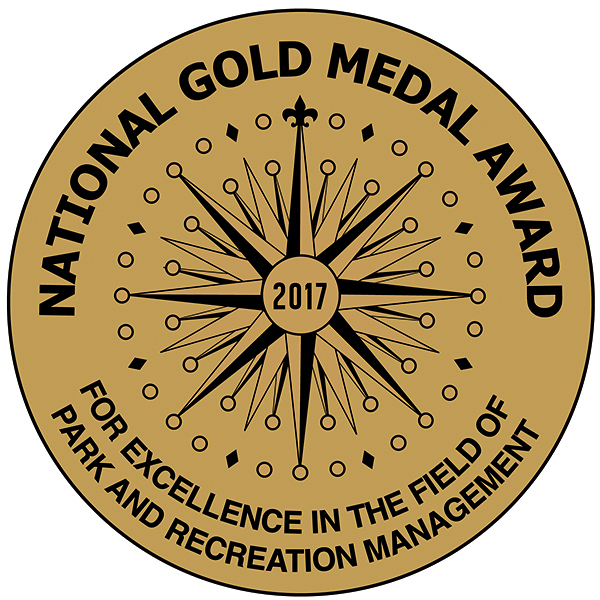 These include hiking trails, bicycle paths, greenways and scenic byways through rural and urban landscapes, and cultural and heritage trails that preserve and commemorate major events in our nation’s history. The promise and challenge of Millennium Trails is to preserve and enhance a precious part of our national heritage for future generations of Americans to treasure and enjoy. The Missouri Valley Millennium Trail received this designation in 2001. This gravel trail on Divide Avenue and College Drive (the north corner of Tom O’Leary Golf Course) is designed to showcase a variety of plant life, including native trees and shrubbery, as well as non – native plant life. “George Bird” Rotary Park Arboretum Trail is a cooperative project of the Park District, Bismarck Forestry Department and the Bismarck Rotary Club.